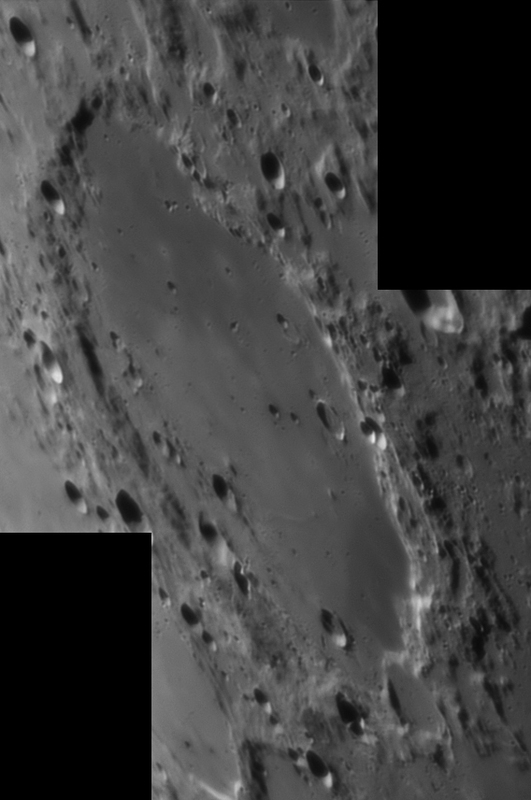 Schickard is a lunar impact crater of the form called a walled plain. It lies in the southwest sector of the Moon, near the lunar limb. As a result the crater appears oblong due to foreshortening. Attached to the northern rim is the lesser crater Lehmann, and to the northeast is the even smaller Drebbel. Southeast of Schickard is Wargentin, a lava-flooded plateau. Schickard has a worn rim that is overlain in several locations by smaller impact craters. The most prominent of these is the irregular Schickard E across the southeastern rim. The floor of Schickard has been partially flooded by lava, leaving only the southwest portion uncovered and rough-textured. Schickard’s floor is marked with a triangular band of lighter-albedo material, leaving relatively darker patches in the north and southeast. This feature is more prominent when the Sun is at a relatively high angle. There are also multiple small crater impacts on the floor, most notably in the southeast.